Trump is the bubble president. Trump lives in a fantasy of triumph. He will never do anything to win back the voters he’s lost. 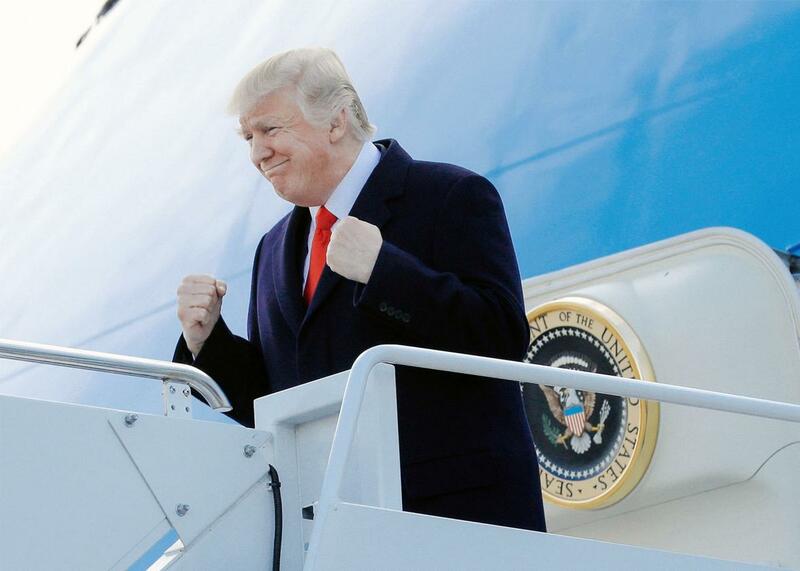 President Donald Trump pumps his fist as he arrives aboard Air Force One at Louisville Air National Guard Base in Louisville, Kentucky, on March 20. Among the most striking aspects of Donald Trump is how, as president, he has taken the pathologies and dysfunctions of the modern Republican Party and brought them careening to their logical conclusions. The racial dog-whistling of Republican campaigns since Richard Nixon becomes outright racism in the hands of Trump; the contempt for expertise seen from the party’s right-wing base becomes an administration staffed with amateurs and apparatchiks. And now, as the president’s approval sinks to new lows, what was once Karl Rove’s disdain for the “reality-based community” has inevitably given way to a president who chooses to disregard reality altogether, living instead in his own private Idaho where he is beloved and successful. We see this most clearly in President Trump’s Twitter feed, where he denounces unfavorable coverage as “fake news” and seeks to delegitimize anyone who threatens the edifice he’s built to block out the reality of his tenure. In just the past few days, for example, Trump has claimed that his base is “far bigger & stronger than ever before (despite some phony Fake News polling)” and has declared that “After 200 days, rarely has any administration achieved what we have achieved…not even close!” He concluded that tweet with an admonition. “Don’t believe the Fake News Suppression Polls!” The president is largely indifferent to evidence and observable reality, but he has an intuitive grasp of the crowd. He’s not tweeting to the wind: He’s tweeting to affirm the faith of his supporters, which in turn bolsters his own fantasy of popularity. It’s disturbing enough that this defines Trump’s behavior as president. But unfortunately, he’s not alone in constructing this alternative universe. It’s no surprise he spends considerable time watching Fox News; in the world of Fox, the Trump presidency is smooth sailing, and the real scandal is still Hillary Clinton’s emails. His supporters and advisers are also committed to maintaining the fantasy. Former campaign manager Corey Lewandowski recently praised Trump as “the greatest communicator we have ever seen” in politics, a remarkable superlative for a president whose administration routinely walks back or downplays his rhetoric. In the midst of his bellicose statements toward North Korea, for example, Secretary of State Rex Tillerson insisted that nothing has “dramatically changed” about America’s relationship with the country. The folders are filled with screenshots of positive cable news chyrons (those lower-third headlines and crawls), admiring tweets, transcripts of fawning TV interviews, praise-filled news stories, and sometimes just pictures of Trump on TV looking powerful. Vice also notes that Trump’s now-former chief of staff and press secretary, Reince Priebus and Sean Spicer, once competed for the privilege of delivering the folder to the president. The truth, of course, is that the president is strikingly unpopular. A new CNN poll has Trump’s approval down to 38 percent, with 56 percent disapproving of his job performance. The intensity of the disapproval is striking: The vast majority of Americans who disapprove of the president strongly disapprove. Only 37 percent of Americans say he has the right priorities while 59 percent say he hasn’t paid attention to the nation’s most important problems. Majorities don’t trust his handling of foreign affairs, tax policy, or even immigration, his signature issue. Fifty-nine percent of Americans say that the first six months of the Trump administration have been a failure. That’s just one piece of information, but other data show a similar trend. A recent Gallup survey—based on interviews with more than 81,000 adults from the beginning of his term until this summer—found that Trump’s approval had fallen below 50 percent in 33 of 50 states. Not only is his standing down in states that backed Hillary Clinton, but it is falling in places that gave Trump his victory, like Michigan, Pennsylvania, and Wisconsin. And while he’s still popular among whites without a college degree, his standing with college-educated whites has collapsed. In North Carolina, for example, his approval with this group has dropped 19 points compared with his share of their vote in 2016. It’s dropped 18 points in Georgia, 15 points in Ohio, and 11 points in Michigan. Overall, it has dropped 9 points. On one hand, because this counts all adults, and not just those likely to vote, the extent of Trump’s decline is probably exaggerated. On the other hand, there’s no doubt that he has weakened, and done so in a way that would jeopardize his re-election. This is why Trump’s reality-distortion bubble matters. A more astute president—or at least one with a certain level of self-awareness—would take this as cause to change course and recover with his more marginal supporters. Any demonstration of competence—like crafting and shepherding middle-class tax relief—would help. But Trump is surrounded by loyalists and enveloped in a fantasy of triumph and will see no need to adjust. The people he might listen to, like his daughter and her husband, have shown no appetite for disturbing this daydream. And the people who might challenge his complacency—like his new chief of staff, John Kelly—have openly said that they cannot change the president. All of this leaves the country in an unusual place, with a president obsessed with (or even addicted to) an image of fame and prestige, unwilling to countenance anything that disturbs it, and enabled by a vast media infrastructure that also happens to shape a similarly large electorate. It’s not just Donald Trump who lives in this fantasy—it’s millions of other Americans too. And for now, they have no desire to leave its embrace.